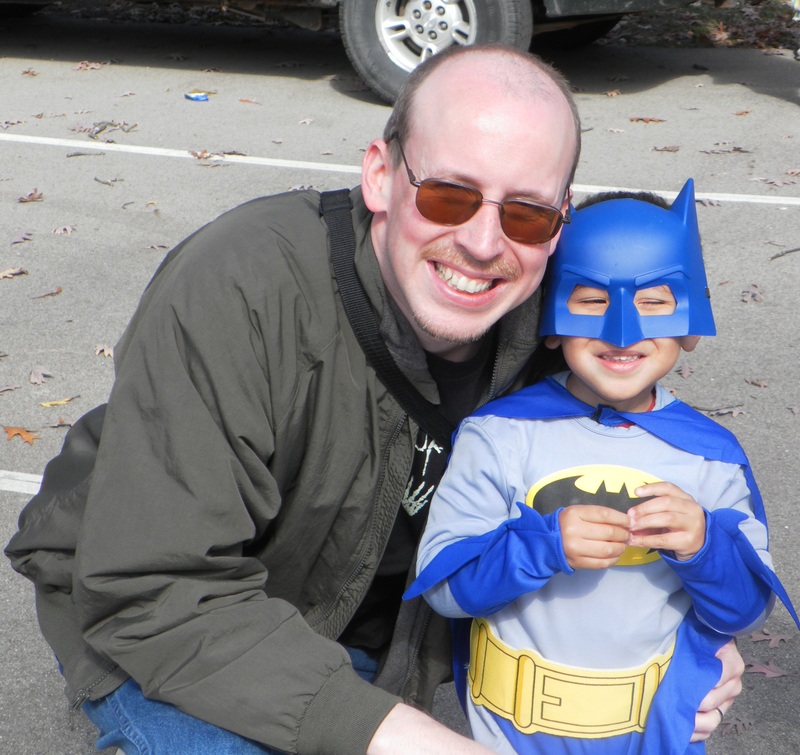 I wrote previously about my son’s refusal to say “Trick-or-Treat” while trick-or-treating. It’s only fair that I now document my own awkward behavior during trick-or-treat. Fathers aren’t supposed to try to live vicariously through their sons until the kids are at least old enough to start playing organized sports. I may have jumped the gun a little bit. At Halloween, our neighborhood is a veritable land of milk (duds) and (bit-o) honey. There are mounds of candy out there for the taking. Naturally, I want my son to get the most out of the bounty that has been provided for his trick-or-treating pleasure. When I was a kid, I could only dream of a place like this. My neighborhood consisted of two nearby houses (from one of them, I was sure to score a nice, healthy apple). Trick-or-treating was done by car. We had a regular route that took us to about 10 houses in the surrounding countryside. I could have carried all the candy I got in my pockets. Beautiful scenery, yes. But none of those trees give out candy on Halloween. Last year was my son’s first year of real trick-or-treating. I made sure that we began early enough so we could haul in a respectable load of loot. I didn’t account for tired arms or sore feet. About 40 minutes into the night, the boy asked me to carry his plastic, candy-holding pumpkin. “It’s getting too heavy,” he complained. The child inside of his father was tempted to upbraid him for such a complaint born of luxury. “My pumpkins were never too heavy,” this inner child wanted to say. “You know why? Because they never had any candy in them. And, what’s more, my pumpkins were grocery bags.” I beat down that inner child, patted my boy on the head, and helped him with his pumpkin. A little while later, as I was making a mental map of all the streets we’d yet to hit, my son asked if we could go home. “My feet hurt,” he said. By now, I had conquered that ugly inner child, but the father still wanted more for his boy, even if it were only more chances at tooth decay. It was his due, and somehow that made it my due, albeit long-deferred. “Don’t you want to go to just a few more houses?” I asked. “We can get more candy.” I’m sure I meant that he could get more candy, but that’s the way it came out. “No,” he said. “I just want to go home.” Halloween was in danger of turning sour on him. No one remembers a death march fondly. Since his feet were already sore, I didn’t make him carry my childhood baggage anymore. I took him home, but the whole way I made note of each of the houses we had missed. He had all the candy he needed, and more. Yet I found myself counting the missed opportunities. I wonder if I’ll behave better this year. This entry was posted in Holiday Hijinks and tagged childhoon baggage, children, family, fatherhood, Halloween, humor, parenting, tooth decay, trick or treat. Great post. I remember growing up in the country where trick-or-treating was a physical endeavor. You had to work hard for those fillings. I must have been an overachiever, because I sure got enough of them. I’d never imagined having to carry Batman because his feet were too tired. What kind of superhero does that make me? That is brilliant… Only a few days left to Halloween, which isn’t a lot of time to train. But just enough for a Training Montage Sequence! Of course! How could I have missed it? We need a montage! Tibor loves Halloween. They don’t have a similar holiday in Hungary and our girls are allergic to 99% of the Halloween haul they bring home. Make sure you limit him to one piece of candy per day. There’s nothing worse than having to deal with us old guys on a sugar buzz. “No one remembers a death march fondly.” Amen. Been on a few of these. We told our kids on our first trip to Europe that it was illegal to carry children in London and Paris. We had some long walks with lots of breaks for ice cream. Parenting at its finest. I don’t usually look to Europe for guidance, but those no-carry laws they have sound brilliant! I grew up in the country as well, which meant lack of houses to hit for candy. My sister and I were so unsure of ourselves on this holiday that we would fight over who had to knock on the door and say “trick or treat”. Our children have no such qualms!!! Have a Happy Halloween this year! Happy Halloween to you as well. I’m glad to hear that your children have it good. That’s what it’s all about. Love this! I remember seeing kids with full pillowcases and always wondered how they got so much candy in so little time???? I had a paper sack too. It was always cold in Wisconsin and I remember layering up, but Colorado has had its share of nasty years when my own kids didn’t stay out long. It will be in the 70’s this year! Whoa…I better stock up on candy…. Thank you. We give out tons of candy every year. Now we push our children to start to bring it back to us. This is fantastic :’) What else are children for, if not to vicariously live through? I love the idea of you urging him to carry on, it speaks to the side of me that measures success by endurance. The more houses, the more sore feet and tiredness, yes, but also the more potential for sweets! There’s a price to pay for every victory, right? Thanks for visiting. I hope you don’t behave differently this year! Have a fun and safe halloween together! Thanks very much. A happy Halloween to you and yours as well. Unless you want to tell your son a ghost story about what happens when you whine on Halloween, you’ll just have to be patient and hope that with age comes strength and wisdom, even for little boys. Hopefully, with age comes patience for fathers as well. Thanks for stopping by. Thanks for giving me something to read. I also grew up where we had to trick-or-treat by car and you had to work for every tiny tootsie roll you did get. Now that we live in an area with houses a-plenty, I also secretly think of how much loot my own kids can bring home. Never mind the stomache aches, tooth rot and the fact that they don’t like half the candy they receive — the bounty is there! I don’t go trick-or-treating with my kids anymore; it’s my husbands job. And I have resigned myself to understand that just because something is there, doesn’t mean it needs to be taken. I hope you behave better than last year. Happy Halloween! Now that I’ve admitted that I have a problem, it should be easier for me to behave better. We’ll see if that turns out to be true. Happy Halloween to you too. The first step to recovery, as they say! Yes. I’m a recovering father. Hmmm…. When I put it like that, it sounds like this recovery could take quite a long time. well put. There is something to that. We may bring along the wagon this year. That way we can go until they’re completely exhausted and then pull them home. Unless the wagon is too full of candy by then. Happy trick or treating. I too grew up in the country and know exactly what you are talking about!! We really push our kids too!! They still have mainly baby teeth so they should eat as much candy as possible now! By all means, get the most out of those baby teeth. Their days are numbered anyhow. Happy Halloween. Hilarious. I love your caption about the pumpkin not big enough to carry your childhood regrets. I really love your sense of humor. And I hope you help him eat all the candy; it’s a lot to expect of a young child. A good dad always helps his kids out. Glad you enjoyed it. If your kids love Halloween that much, you must be doing something right. Happy Halloween and thanks for contributing to the discussion. I don’t think you’re alone; I have dim recollections of my father egging me on through unfamiliar neighborhoods. I was so tired but he knew he could weasel a few more ounces of candy out of me. Sometimes a father’s love may seem to make no sense, but it is love nontheless. That and, sometimes, a sweet tooth. My children are fuddy-duddies!? My husband would go out on a Saturday night and ask the kids if they want to go with us…”Naaa. We’ll just stay home and read or play the wii.” What!? We don’t force them either. Good post! I can’t wait until my kids are old enough to be left home alone. And then if they would learn to read, that would be bonus. There is no wrong when candy is involved! Haha, great post! I can’t wait to take my baby girl out for candy. I hope I can stay as aware as you did, I will probably be eating candy as it’s placed in the bag. NO, you have to wait until you get home to steal her candy. Otherwise, people will think you’re a bad parent. Thanks for that advice I need the wisdom of dads who are experienced in these type of situations. Stop by any time you need advice on what not to do. Here, in southeastern PA, Halloween will probably be cancelled because of the witch from the water, Hurricane Sandy. I have 8 big bags of dark chocolate M&M’s which will go into my evac bag; a treat to enjoy while enjoying nature’s trick. Here’s hoping Sandy stays away. If worst comes to worst, M&Ms are very comforting. Happy Halloween and stay safe. I think as a parent there is always the question of being too hard or too soft on the kids, when I was a kid I always would opt for my pillow sack over a plastic pumpkin to hold candy because it could hold so much more. I think in the end we as parents are caretakers at best and can only do so much. The company I work for deals in helping small children stay in organized sorts by teaching them the fundamentals of the game, which is very important. Kids would probably like it if we could just be consistent. We tend to vacilate between too hard and too soft. It must be confusing. Your kid is already a winner. He’s Batman. I thought you were gonna say he’s already a winner because he has a great dad. Now that would have been the best comment ever. Oh well, I guess he’ll have to settle for being Batman. You were so close . . .
OK, vyvacious, I’ll give you full credit for that one. As long as you charge a candy tax (like, 50% of the haul), you can still call yourself a successful halloween parent. At least, that’s the standard I’m shooting for. Congrats on the FP! Wow, taxes are high at your place. What are you, Sweden? Thanks. Uh! Kids today… don’t know they’re born. But they sure know when their feet hurt.